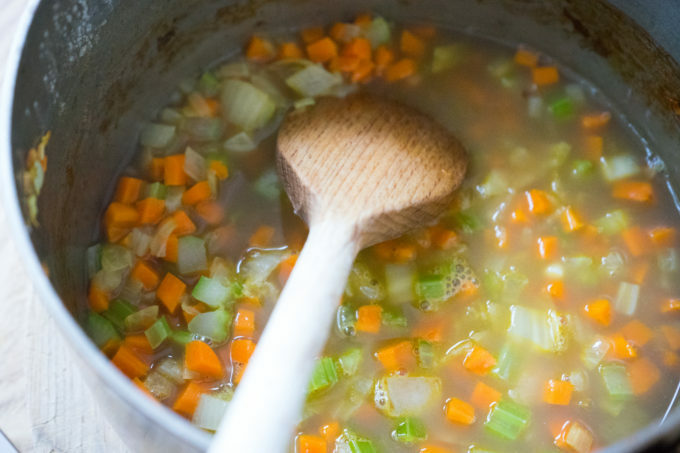 Pasta e fagioli is one of the most popular soups in Italy, particularly in southern Italy, Veneto and Tuscany (Tuscans are known as "mangiafagioli", bean eaters, so this not surprising). Each area has its own variations. 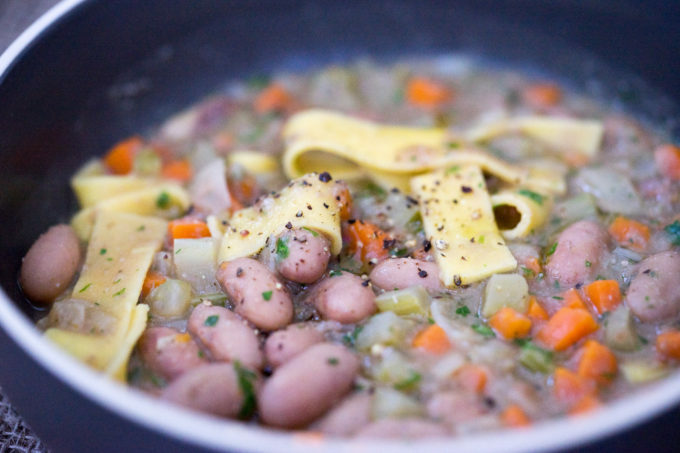 In Piedmont, borlotti beans and boiled with potatoes, lardo or salami and a soffrito of carrot, celery, onion, leek and garlic and cut up egg tagliatelle are added. In Veneto and Friuli, borlotti beans, lardo, pancetta or pork rind are cooked with egg pasta. In some parts of Friuli, pig's trotters are added. In some versions in Veneto, the Lamon bean is used and potatoes are added. In the Dolomites in Veneto, Lamon beans are cooked with oil, butter, carrot, celery, tomatoes and pumpkin and tagliatelle is added. 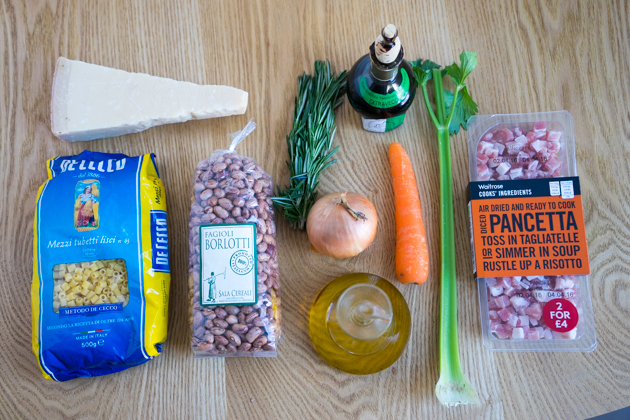 In Tuscany, cannelloni beans are used and are flavoured with garlic and chilli. In Emilia, beans are stewed with tomatoes and served with egg maltagliati. In Naples, the soup is thicker and oregano, chilli, garlic, fresh tomato and a mixture of pasta shapes are used (a great way of using up a mixture of leftover pasta shapes). Spicy pork sausages are added in another Neapolitan variation. Soak the beans overnight in water to cover. 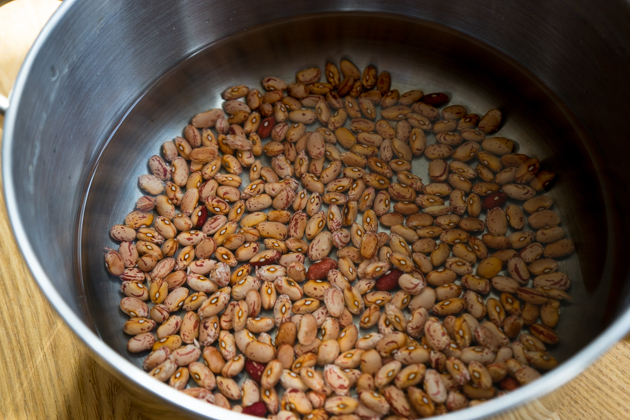 If you forgot to soak the beans, place the beans in plenty of water in a large saucepan in a 145C oven for 90 minutes. 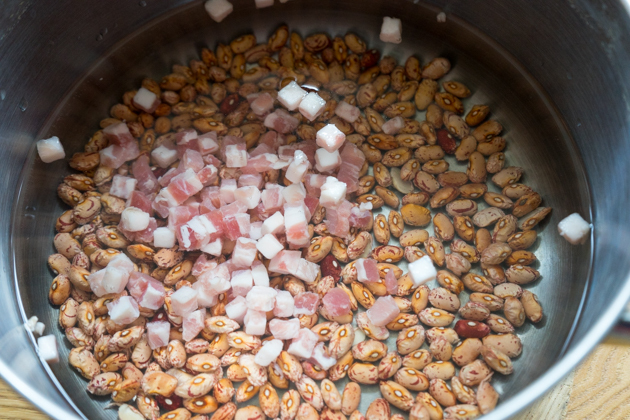 Place the beans, pancetta, salt, black pepper and 2 litres of water in a large saucepan. Heat over medium heat to a simmer and let cook for 1 hour. 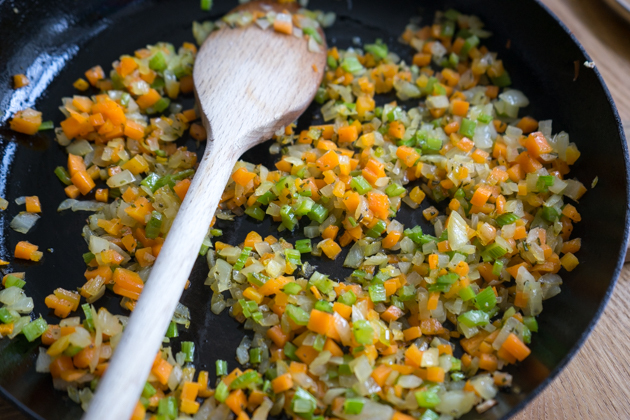 Meanwhile, fry the the carrot, celery, onion and rosemary in the olive oil until soft, about 5 minutes. Add this to the beans and cook another 20 minutes. Meanwhile bring to boil a large pot of 4 litres of water and 40 grams of salt. 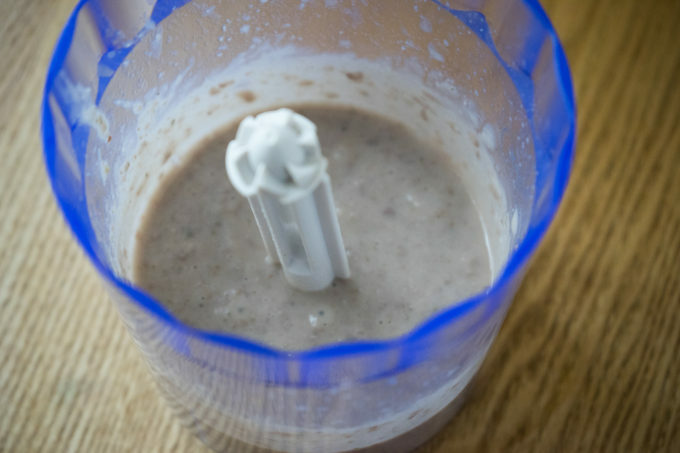 Carefully puree half of the mixture and add back to the beans. Adjust the salt and pepper to taste. 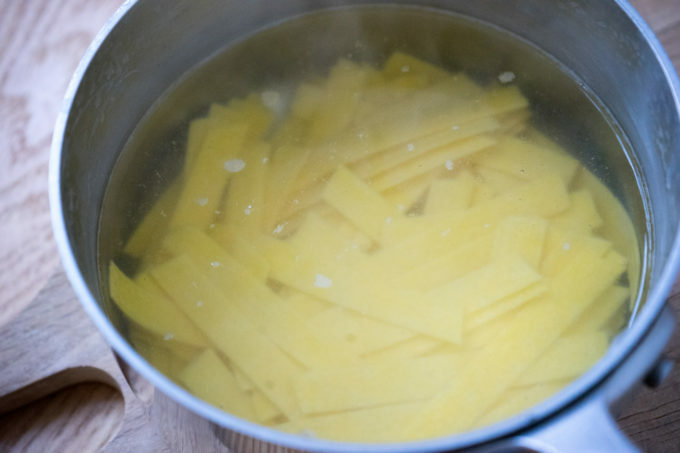 Cook the pasta separately in salted water. Cook the pasta for the time indicated on the packaging (or for fresh tagliatelle for 1-2 minutes). 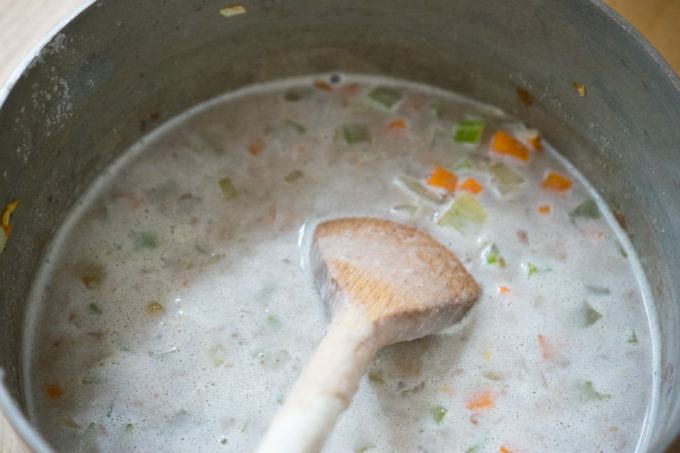 Ladle the soup into 4 bowls. Grate some black pepper over top. Sprinkle the cheese over top and add a drop of traditional balsamic vinegar if you wish.